When our ancestors left Egypt in great haste, there was no time to wait for their dough to rise. They therefore ate Matzah, unleavened bread. When Moses instructed the Jews to prepare Matzah for the Pesach Eve feast (scheduled for the night before their anticipated departure from Egypt), he enjoined them to “guard the Matzahs – “Ushmartem Et HaMatzos” ( Exodus 12:17 ). This verse is the basis of an interesting law. It is not enough to eat Matzah on the Seder night; it is also a Mitzvah to guard the Matzah’s dough as it is being prepared for baking, so that it does not rise. Indeed, Shmurah means “watched,” and it is an apt description of this Matzah, the ingredients of which (the flour and water) are watched from the moment of harvesting and drawing until they are baked. Shmurah Matzot are under strict supervision to avoid any possibility of leavening during the harvesting and baking process. What is Handmade Matzah Shmurah? It is easy to recognize a hand-baked Matzah, because they are round in contrast to the square-shaped machine-made variety. Interestingly, the Torah describes the Matzah that the Jews ate when they left Egypt as “Ugot,” a Hebrew word that also means round-shaped. Whilst one could buy machine made Matzah Shmurah, many people ensure they eat hand-made Matzah Shmurah on Pesach and certainly for the Seder. Why? As mentioned above Matzah represents the genuine and pure faith of the Jews, being led into an unknown desert with only unleavened dough on their shoulders. The basic book of Kabbalah, the Zohar, therefore calls Matzah the “Bread of Faith.” Whilst eating Matzah is a physical act, the Kabbalah teaches us that when we eat Matzah, we are, in fact spiritually nourishing our souls with an infusion of faith. Eating Matzah, practically impacts our belief in Hashem. Faith can be superficial, even to the extent that we believe in G‑d and turn to Him with a request that is contrary to His will. For example, the Talmud relates that prior to a thief embarking on his mission, he may cry out to G‑d to help him in his act of theft. As preposterous as this sounds, if we are honest with ourselves, we may find that we are in a subtle way guilty of conducting ourselves in a similar manner. How often do we act contrary to the faith we essentially have whilst asking G‑d for His assistance and blessing in that very act? The Zohar teaches us that eating Matzah actually helps internalise our faith as we digest the spiritual nutrients within the Matzah ensuring that our actions become more consistent with our faith. The Matzah that contains these special spiritual nutrients is hand-made Matzah Shmurah due to the intention of the people involved in the baking process. To help us understand this, let’s analyse another Mitzvah and the process it involves. The Mitzvah of Mezuzah begins even before we attach it to our doorpost; it starts with the way the Mezuzah is written. Similarly, we can view the Mitzvah of baking Matzah Shmurah. The Mitzvah begins with mixing the dough, rolling and shaping the Matzah and putting the dough into the oven to bake. These are all activities that must be performed by adult Jews. In fact, as the Matzah is being made, all those involved constantly repeat, “L’shem Matzot Mitzvah – we are doing this for the sake of the Mitzvah of Matzah.” This is why machine-made Matzah is not, according to many, the best choice for the Seder as it does not contain within it the man-made intention for the duration of the whole process. Hence, hand-baked Matzah Shmurah is becoming more and more popular and many people eat it for the entire Pesach. This practice was strongly encouraged by the Lubavitcher Rebbe. 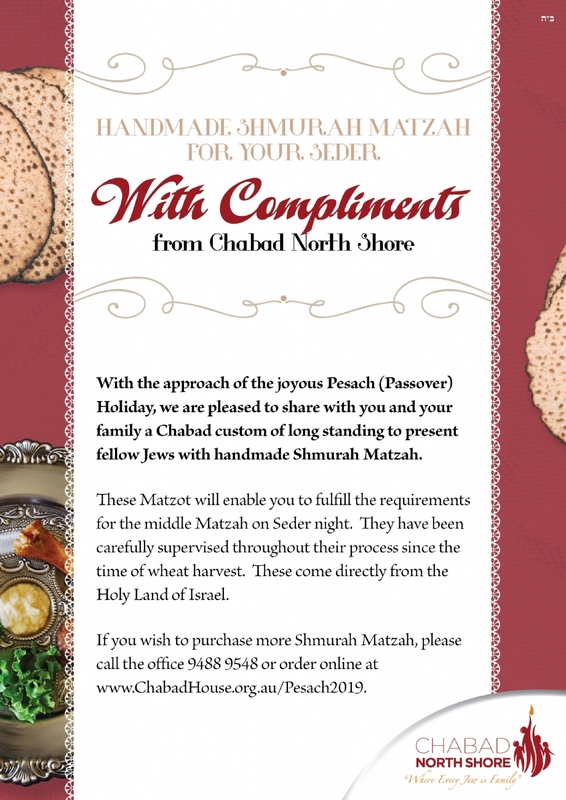 Why not make the effort to have hand-made Matzah Shmurah at least for the Seder? How much is an injection of faith worth? Wishing you and yours a Happy and Kosher Pesach.